A RIDE AS BOLD AS YOU. Boasting all the space you need and all the technology you want, the new 2018 Toyota Highlander SUV is the complete package for drivers who need a family-friendly vehicle. Test-drive a 2018 Highlander at our Toyota dealership near Bay City, MI, to explore its advanced entertainment options and luxurious amenities firsthand. Want to learn more about how you can buy or lease a new 2018 Highlander? 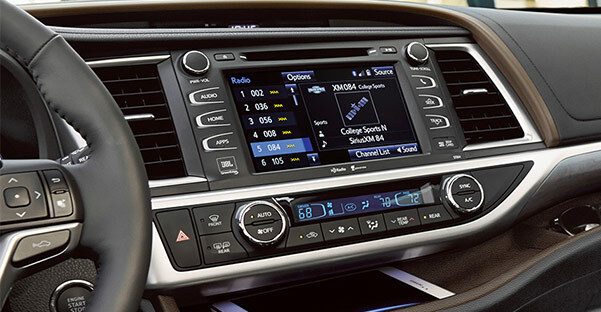 Apply for Toyota financing and get the competitive finance rate you've been searching for! Explore the new 2018 Highlander now at Serra Toyota Saginaw to find the trim level and Toyota financing plan you love. 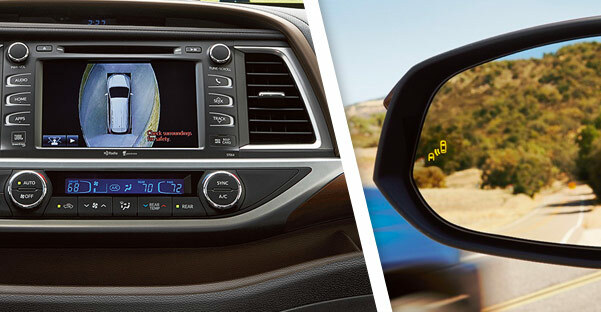 Get ready for driving at its finest when you finance a Highlander! Radio and Technology: Entune™ Premium Audio with Integrated Navigation and App Suite - includes Entune™ Multimedia Bundle (8-in. high-resolution touch-screen with split-screen display, AM/FM CD player, MP3/WMA playback capability, six speakers, auxiliary audio jack, USB 2.0 port with iPod® connectivity and control, advanced voice recognition, hands-free phone capability, phone book access and music streaming via Bluetooth® wireless technology), Siri® Eyes Free, Entune® App Suite, Intelligent Touch controls, SiriusXM® Satellite Radio with 3-month complimentary SiriusXM All Access trial, HD Radio™ Technology, HD Radio™ Predictive Traffic and Doppler Weather overlay, AM/FM cache radio, Gracenote® album cover art and integrated backup camera display with projected path. Access to Entune® App Suite is subscription-free. See toyota.com/entune for details. Radio and Technology: Entune™ Premium JBL® Audio with Integrated Navigation and App Suite - includes Entune™ Multimedia Bundle (8-in. high-resolution touch-screen with split-screen display, AM/FM CD player, MP3/WMA playback capability, 12 JBL® GreenEdge™ speakers, auxiliary audio jack, USB 2.0 port with iPod® connectivity and control, advanced voice recognition, hands-free phone capability, phone book access and music streaming via Bluetooth® wireless technology), Siri® Eyes Free, Entune® App Suite, Intelligent Touch controls, SiriusXM® Satellite Radio with 3-month complimentary SiriusXM All Access trial, HD Radio™ Technology, HD Radio™ Predictive Traffic and Doppler Weather overlay, AM/FM cache radio, Gracenote® album cover art and integrated backup camera display with dynamic gridlines. Access to Entune® App Suite is subscription-free. See toyota.com/entune for details.